A couple of weeks ago, we were just minding our own business. Living normal life. And then things changed. They changed on an evening when we saw a picture of a little girl. And we were faced with a decision: between wishing someone would do something and doing it. We wrestled. We prayed. And we decided. Meet Brooklyn Faris! She is 10 months old in China. She has a condition called biliary atresia, where the ducts that carry bile from the liver to the small intestine are blocked and damage the liver. She is currently in liver failure and needs a liver transplant ASAP. 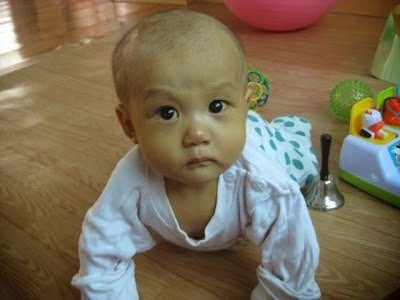 We found her through a good friend who had just seen a post about her on a China Waiting Child Advocacy Facebook group. There were many inquiries and comments. Maybe someone will adopt her, we hoped. Maybe the someone is us, we wondered. Maybe the someone is us. We had one of our nightly long conversations about the possibility of pursuing the adoption last week. We each shared feelings and thoughts of fear that were holding us back. We prayed together, for specific things, for specific direction, for specific leading from the Lord. It was a big prayer...a vulnerable prayer. I checked Facebook 30 minutes later, and there was a message from a stranger on my phone. She was writing to tell us that our names had been shared with her, and she wanted us to know she was praying for us. And we could not finish reading her message without breaking down in tears, because her words were direct responses and echoes of the prayer we had just offered half an hour before. We sat there reading her message, and we knew. We knew that the someone is us. Pursuing adoption often means walking into the fear, pushing into the hard places, following God into the dark. We don't know how Brooklyn's story will unfold--our fears persist about how it might...but we do know that she deserves a family that loves her, that will fight to get to her, that will push through the hard for her. Every child deserves a family who will do that. We could spend our lives wondering if anyone will, or we can make bold choices to follow the Lord wherever He leads. We are working lightning fast to start and finish a home study and dossier in a month's time. We are trusting God to provide each expense and fee as it presents itself. We have stepped off the cliff. This will be a medically expedited case--the faster we can get B home, the better. We need your help! Please lift Brooklyn up in prayer constantly. We confidently believe God will move mountains to sustain her health and to get her home. (Home!!! :) ) Please pray for us, that the Holy Spirit will continue to give us His peace to move boldly with faith. We'll let you know soon some other ways you can help. We're all in this together, friends. Oh WOW! Such wonderful news! I'm thrilled for your growing family, and, of course, about the prospect of meeting Brooklyn! We will keep thoughts of you all in our hearts and I hope that everything goes smoothly with the transition into your care.